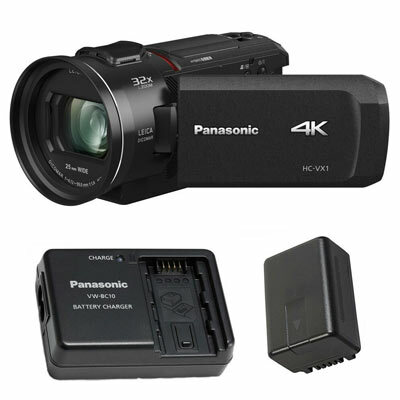 For those wanting a dedicated 4K video machine with a huge zoom range, optical image stabilization, and good lowlight performance, the Panasonic HC-VX1 seems to tick all the boxes. However, it does come with some caveats which we will check out below and see if everything in this all-in-one dedicated box fits well into this end of the market. This design of video camera has been very popular since its first inception. Compact enough to be taken anywhere and gives entry-level videographers a chance to operate a straightforward video camera and still get high quality results. It sounds odd, but when holding one of these machines you feel more like a video guy rather than using a smartphone or stills camera which includes video. The specs of the Panasonic HC-VX1 start with a 1/2.5-inch MOS sensor which is back-illuminated and should allow high levels of gain. This will introduce noise, but the final footage is still usable with good color reproduction, some quoting up to 12dB of gain. The sensor has a resolution of 8.57 MP which results in UHD 4K at 30 frames per second and stills up to 26 megapixels. The maximum aperture is f/1.8 – f/4 with a 16:9 aspect ratio, a usable touchscreen LCD, Micro-HDMI and USB sockets, microphone and headphone inputs and a reasonable weight of 15.10 oz/428g. The zoom range is impressive, with a 35mm equivalent of 25mm–600mm or 48 times zoom, but its digital zoom from 24 times and upwards. Luckily, 24 times zoom is usually adequate for most situations. The Panasonic HC-VX1 employs three O.I.S. systems to reduce blurry footage. The first is a 5-Axis Hybrid O.I.S. + which should reduce blurring and vibration from wide-angle to very zoomed in. Secondly, is Adaptive O.I.S. which automatically changes settings depending on your conditions and lastly the O.I.S. system for reducing handshake. All of the systems work relatively well even when zoomed in which is a key need for a small camera such as this one with such a large zoom range. A ZEISS Vario-Sonnar T* lens is used with a 52mm thread for increased optical quality. The camera is very simple and straightforward to use with basic control settings across the board. Because of this, there are lots of features packed into the camera, it’s just a shame that the 4K video output is cropped which all the features work with. However, with loads of out of the box features, there’s enough here to tweak your footage, even though some are not that useful. For example, Active Contrast automatically equalizes gradation depending on the brightness and an image. It can lift shadow detail, but as its fully automatic it may not always produce the results you want. A Cinema-Like Effect and level shot function are also fully automatic features, so it’s really down to experimentation if they can work for you or best left for post editing. Lastly, the battery is stated as being usable for an hour per charge. Extra batteries need to be charged by the camera or direct connection to a wall socket, so it is advisable to charge all your batteries ahead of a shoot. Video footage can be captured at 4K – 3840 x 2160p at 30 fps, but it does have a crop factor. Files are stored as MP4s or AVCHD on SD/SDHC/SDXC cards making everything as accessible as possible. The back-illuminated sensor definitely helps in low light conditions. No matter the gain level, footage will include noise but still look fine in all other areas. This is acceptable for a small sensor camera such as this one. Panning too quickly with this camera can introduce rolling shutter and moiré. There is a warning feature to tell you if you are panning too quickly, but this should be front of mind when using this camera regularly. i.e. you will need to plan your shots a little head of time. As most of this camera is automatic in its functionality, this also applies to the focusing. There is no manual focus, only autofocus which means there will be times where focus will be hunting, especially in low light or brightly lit backgrounds. This is where you will have to experiment with the camera to judge how the automatic features work in various conditions. One quirky feature in the camera is the picture in picture (PiP) options. One use of these facilities which could be quite beneficial is the ability to hook up to three smartphones to get a multi-cam view in your footage. All the functionality is easily operated through the Panasonic Image App. The PiPs all have varying degrees of usefulness depending on your needs. The camera is not great at a shallow depth of field, mainly due to its small sensor. In its defense, with such a long zoom range, the camera will be mostly used for distance footage, such as shooting sports or action, rather than very close-up footage. Other Panasonic cameras in this range include the HC-WXF1 with an EVF and twin camera. It is though, more or less the same camera as the HC-VX1 for more money. If you don’t need EVF the HC-V800 has the same facilities as the HC-VX1, but only shoots HD at $600. Looking at other cameras in the price range the Sony FDR-AX33 has the same levels of functionality, just with slightly smaller resolution stills at 20.6MP. Give this camera enough light and the image quality is very good. The camera can also take a reasonable amount of gain and still produce viewable footage, although with the same level of noise as found from other small sensor cameras, just with better color rendition. The 4K footage is cropped, but this may not be such a big deal, considering its price point and entry-level features. We get why most of the features are fully automatic, due to its entry-level nature but some manual control would have made this a far better offering. The huge zoom range will suit a wide range of applications, with the camera being the most useful for those who want 4K for a reasonable price. Possible applications will be for vlogging or quality home footage.